How much nicer it would be if Bihar, UP, Maharashtra, etc, are split into smaller governable provinces. This won’t hurt to say with the Bihar elections concluded and the key Uttar Pradesh polls not due till 2017. Bihar and Uttar Pradesh need further subdivision to smaller states having 20 or so Lok Sabha seats. The principle needs extension to other large states as Maharashtra and West Bengal. Tamil Nadu with fewer than 40 seats may be border-line but division won’t harm. Divisions will be solidly resisted by the political class and especially by regional politicians. Bihar politicians did not easily give up Jharkhand. Its mineral assets were stripped and cashed before every election. Nor was Uttarakhand peacefully carved out of Uttar Pradesh. At the time, the leaderless Uttarakhand agitation seemed destined to fail. The formation of Telangana was long overdue. Laloo Prasad Yadav, Mulayam Singh Yadav, Mamata Bannerjee, etc, will defy fractionation of their states. But smaller states are inescapable. Smaller states are easier to govern and develop. They may seem unstable from having too few legislators but Manohar Parrikar made an example of Goa with his unvaried thrust to economic growth and development which brought political stability to the state. There is every reason to believe that smaller states fashioned from UP, Bihar, Maharashtra, West Bengal and Tamil Nadu will follow Goa’s stable pattern. In any case, they will each have two to three times more assembly members than Goa. State elections are consuming too much national time and energies. Frequent elections and the negativities they generate is something all parties should get together and minimize. The damage caused to the national psyche is enormous. But super-sized states and their overweighted politics are also hurting national growth and cohesion. Bihar A and Bihar B with 20 Lok Sabha seats each would consume far less election time and exhaust the nation in half of a united behemoth with 40 seats. Uttar Pradesh divided into three entities will cease having a disproportionate influence on national politics. It is disconcerting that it controls a seventh of the Lok Sabha. Wouldn’t smaller states come at a cost of a strengthened Centre? That is not so terrible. All the same, the Congress era of sacking state governments at will is over. The Supreme Court is intervening in cases of contentious assembly confidence votes where the speaker is biased. Information transfer is also so fast and far-reaching that a state deliberately neglected by the Centre has a powerful weapon of public opinion to fight back. Public opinion overwhelmingly supports economic growth and development. So the fears of a wilful Centre may be put to rest. But smaller states will definitely mean that they cannot use size to obstruct the national narrative of growth and development. India on the whole will become more governable and amenable to the rule of law. If a spirited campaign gets underway now, perhaps the country will see more numbers of smaller states with better futures in the years to come. Politics in the states will also become less about power for power’s sake than good governance. This piece was originally published at newsinsight.net and has been republished here with permission. Activists of the Kosal Kranti Dal (KKD) on Sunday held rail roko all over western Odisha to press their demand for a separate State of Kosal comprising the western districts and Baudh and Athmallik. Train services were severely affected and passengers were thrown into immense troubles, railway sources said. The activists totally stopped the goods trains everywhere, it added. “By this, we warn both State and Centre to take an immediate decision for a Kosal State without which the development of this region would be totally impossible,” said president of Sambalpur district unit of KKD Upendra Mahapatra. The KKD activists also stopped trains at Balangir, Kesinga and Rourkela stations. “We will have a State at any cost for the freedom of this region from Odisha,” said party president Pramod Mishra. He also strongly criticised the coastal region leaders for their ‘step-motherly’ attitude towards the western region. Demanding formation of a separate Kosal State, members of Kosal Kranti Dal and All Kosal Students’ Union led by president of Kosal Kranti Dal Promod Mishra, Dolamani Pradhan and others staged a rail roko at Balangir railway station on Sunday morning. The activists demonstrated and stopped two trains, Sambalpur-Rayagada Tapaswini Express and Raipur-Kantabanji-Bilaspur Passenger, for around two hours. At different places in western Odisha namely Jharsuguda, Sambalpur, Bargarh, Balangir and other places, the Kosal Kranti Dal organised rail roko on Sunday to press for the demand for a separate Kosal State. Amongst the demand for separate States all over the country like Gorkhaland, Vidarbha and other smaller States, there is enough social, political, cultural and economic justification for formation of a separate Kosal State, the agitators said. We were forced to merge with Odisha in 1948. What this region has got after 60 years of merger? Only acute poverty and backwardness, pointed out Pramod Mishra, president of Kosal Kranti Dal. We would also launch an economic blockade and western Odisha bandh in forthcoming days, informed Mishra. Like in the Telangana State issue, all the elected representatives of this region should join this movement. If the political representatives of Telangana region could offer their resignation, why the same cannot be expected from representatives of this region, Mishra expressed further. This rail roko would convey the people’s demand for formation of a separate Kosal State to the State Government of Orissa as well as Government of India. In the forthcoming days, our agitation would be intensified further, said secretary of All Kosal Students’ Union Dolamani Pradhan. Two platoons of police were deployed and 53 Kosal Dal activists were taken into custody, informed Assistant Superintendent of Police (ASP) Srikant Mishra to The Pioneer over phone. BHUBANESWAR: Hundreds of people from western Orissa here on Wednesday staged a demonstration demanding separate Koshal State by carving out 11 districts and one sub-division from Orissa. Encouraged by Union government’s approval to separate Telangana State recently, agitators under the banner of Koshal Kranti Dal (KKD) submitted a memorandum addressing the Governor in support of a separate State. “Economically, Koshal region has richest deposit of minerals like coal, bauxite, mica, iron ore, lime, phosphorous, manganese and has potential rivers including Mahanadi, Tel, Suktel, Ong, Indravati and vast hydro electricity ability,” said KDD president Pramod Mishra here. He said the region was endowed with richest forest wealth and Gandhamardan mountain. BALANGIR: Koshal Kranti Dal (KKD) has intensified its campaign for a separate Koshal state. The KKD has even roped in students as a rallying point for the cause. As many as 500 activists were arrested today across western Orissa while staging rail rokos. In Balangir alone around 160 activists were arrested while three trains were stopped. The members of KKD and All Koshal Student Union (AKSU) participated in the rail roko. On Friday, the AKSU activists had burnt Planning and Co-ordination Minister A U Singhdeo and WODC chairman Niranjan Panda in effigies for reportedly speaking against Koshal state demand. Pramod Mishra, president of KKD, said, ‘’We are trying to bring the movement to its logical conclusion. All our activists are now ready to intensify the struggle and we are going to gain mass support soon.” Justifying the stance, Mishra said the Ghadei Commission admitted that western Orissa was neglected for which WODC was formed. 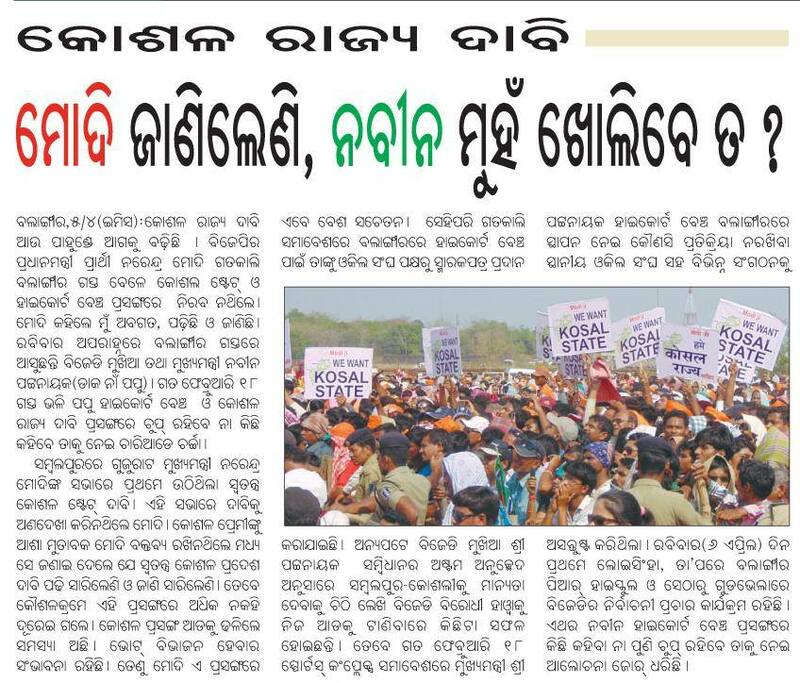 If the commission admitted neglect of western Orissa, then what is wrong in demanding a separate state? he argued. “This is not a political stunt nor is the movement personality-centric. For the development of this region, a separate state is the need of the hour,” asserted Mishra. SAMBALPUR: The KKD activists led by Sambalpur district KKD president Upendra Mohapatra staged a rail roko at Sambalpur Road Railway Station today. The impasse ended after police personnel detained the activists. Similarly, a rail roko was also staged in Jharsuguda, Bargarh, Kesinga and Boinda railway stations disrupting movement of trains. Earlier, KKD had threatened to launch a series of agitations across western Orissa seeking Koshal state. The KKD has called western Orissa bandh in the last week of January and a series of NH blockades across the region in February.